It is named after the Greek Battle of Marathon that occurred in the 490 BCE. In addition to being an Olympic event for both men and women, marathons are run all over the world on a variety of terrains by athletes at various skill levels. To perform well in a marathon, an athlete has to undergo a vigorous training period to develop stamina and learn their physical limitations. According to history, after the Greeks were victorious over the Persians at the said battle, they sent a runner to Athens with the news. Their runner, Pheidippides, ran the entire distance to Athens without even stopping once, announced the victory and then collapsed dead on the ground. His death was a result of the physical stress on his body caused by the long run. Thus, as a tribute and to honor the man, the marathon was created. The marathon was run in the 1896 Olympics, though the official distance was not standardized until 1921. And now, there are more than 500 marathons are held throughout the world each year, with dozens and thousands of participants for smaller and larger marathons respectively. Also, depending on the race, runners either begin together in a mass start, or are dispatched in waves, separated by gender and ability. The course is left open for a set period of time, usually around four hours. 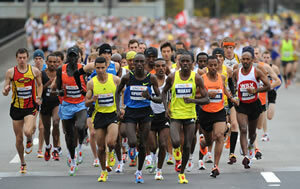 Another factor, related to Marathon, is the very extensive and long training program of the athletes or the runners. As the long distance runs can be very exhaustive and demanding for the body, it is important for all the runners to undergo this type of work out. The program is all about mixed exercises that include endurance running with resting, so that the body is not damaged.